Causality is the relationship between cause and effect – and in landscape photography, this dynamic can help you tell a story, beyond the conventional structures of composition and color. Considering causality in a landscape image can have a number of advantages. First of all, including a visual indication of cause and effect can provide a through-line, within the composition of an image. 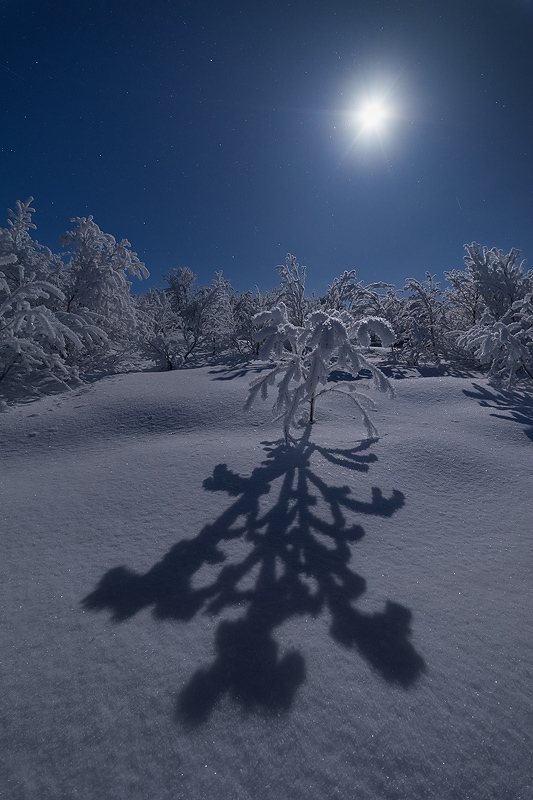 Imagine a light source – mostly the sun or the moon in nature photography – on one side of the frame and the light or shadow it casts on the other side. This simple visual element does a great deal to connect the different sections of the image, and the different compositional elements on a higher level than just symmetry or balance. Causality also adds interest. Images are comprised of several levels. The basic foundational structure is the composition. Beyond that, there’s brightness, color, contrast and similar traits, which bring the compositional elements to life by articulating the more delicate visual intricacies of the photographed subject/s. Including a cause and effect dynamic can add another level in this hierarchy: not only there are interesting elements and good colors, there’s a story. Story-telling can be hard to achieve in landscape photography, but inclusion of a cause/effect dynamic can immediately introduce a different level of content. Picture an image which includes sun rays and a glacier melting into a river. Maybe it’s just a pretty picture, but maybe you’re telling a story about the threat of global warming. 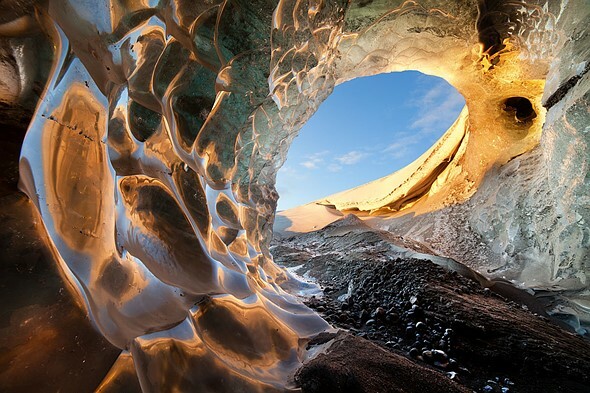 The sun, reflected on the walls of this ice cave, is what caused it to form. This image tells the story of the glacial melting, and the inclusion of the cause and its effect enriches the picture’s visual appeal. The final way that a case and effect dynamic can contribute to an image is by what might be called imagined causality: the inclusion of elements which don’t affect each other in real life, but which are placed in such a way that the viewer is encouraged to imagine they might be related. 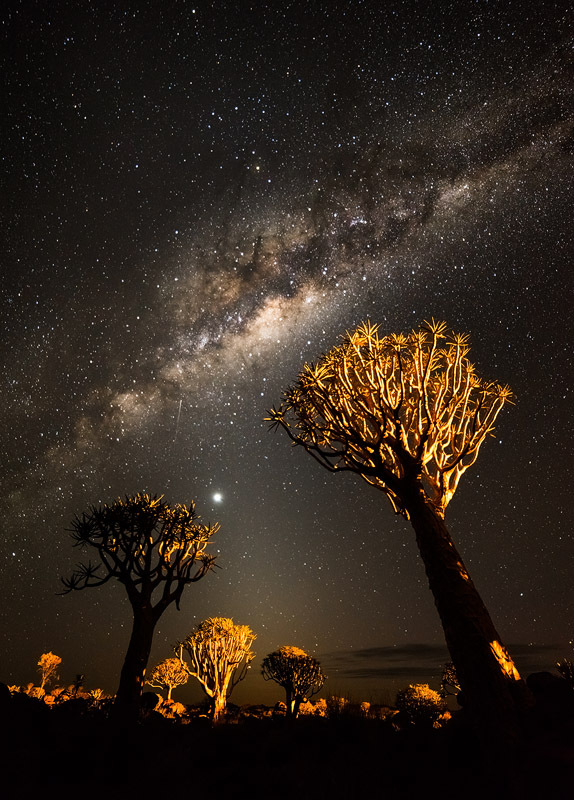 Take for example the image of Quiver Tree Forest, Namibia at night (above). I call the image ‘Phototaxis’, which is the movement of an organism toward a source of light. Needless to say, the Milky Way isn’t what draws the quiver trees to grow upward, but composing them in this way, using the ultra-wide angle lens to cause them to tilt toward the center of the image, all together with the image’s title, encourage the viewer to imagine the trees being drawn to it. The quiver trees are thereby humanized, and the anthropomorphism makes the viewer identify and feel a deeper emotional connection to the trees and to the image as a whole, which is turn achieves our goal as photographers: having the viewer look at the image a bit more carefully, and take meaning from it.